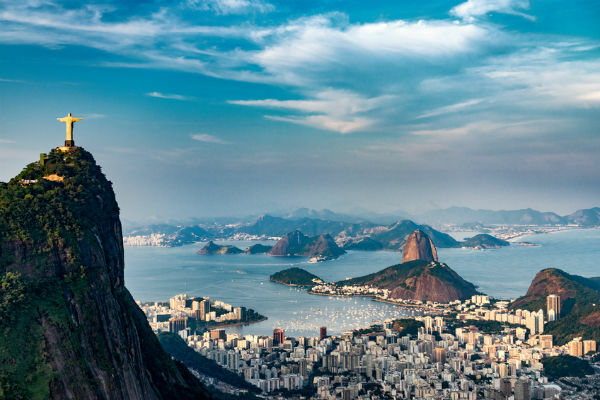 Rio is filled with iconic experiences so try to allow plenty of time to do it all. There’s the striking Christ the Redeemer statue; Sugarloaf Mountain; the beaches at Copacobana and Ipanema and, of course, the delirious beats of Samba, all of which make Rio de Janeiro so unique. Sugarloaf Mountain is a site to behold, rising in cone-shape some 400 metres above the city. Apart from the panoramic views at the summit, it’s also famed for the awesome two-staged cable car ride to get there. The statue of Christ the Redeemer towers 700 metres above the city on the UNESCO-listed Corcovado Mountain. This awesome statue of Jesus Christ features on most Rio de Janeiro post cards and is one of the New Seven Wonders of the World. Ipanema Beach is a main hub for fun in Rio. It lies in up-market “Little Paris”, renowned for its avant-garde art galleries, shops and cinemas. Meanwhile, Copacabana Beach, stretching almost five kilometres alongside the densely populated city is perfect for posing and people-watching. Whether you are after a spot of Samba or a something more sedate like yoga or a foreign language group, there are plenty of meet up groups for you to join and enjoy in Rio. The small Metro Rio currently runs two lines covering 35 stations across the city. The carriages are clean and air conditioned, making your trip a generally comfortable one. If you prefer, the Uber app will access you the convenience of a cab ride to anywhere in the city. Gay people flock here to Rio for the annual Gay Pride and Carnaval events. For the most gay-friendly venues, head for Farme de Amoedo in Ipanema, with its cafes and restaurants. You may see the abbreviation “GLS” which stands for Gays, Lesbians and Sympathisers, meaning anyone with an open mind is welcome. Locals call it the ‘Paris of the South’ and it’s easy to see why with cafés at every street corner, beautiful tree-lined avenues, chic boutiques, tasty food and a relaxed, slightly crazy nightlife. Tango clubs showcase the evocative dance, often described as: ‘making love in the vertical position’ – an absolute must for every traveller! If you crave a succulent steak, parillas (steak houses) line practically every street in Buenos Aires, serving a myriad of cuts. Vegetarians needn’t go without either. Choose from several great vegan and vegetarian restaurants plus others catering for both vegetarian and meat-eating pallets. As for beaches, the best time to enjoy them is from November to February – summer in the Southern Hemisphere. The northern beaches of Partido de la Costa are the closest to Buenos Aires, complete with attractions like Sea World, a water park and lower prices than on the rest of the coast. For city action to go with the beach, Mar del Plata positively pulsates in summer. Solo travellers need not feel alone in the city. From football to yoga and language exchanges to simply socialising, there are endless meet-up opportunities in Buenos Aires. Backpackers abound with most budget accommodation being around the Palermo and San Telmo districts of town. Females travelling alone should take usual care when in a big city – pickpockets abound, particularly on the subway’s line C.
Getting around is easy using the Buenos Aires Underground (Subte), comprising six lines which connect with 103 stations in the city. For a quick, convenient ride, Uber gets you a cab in minutes. Buenos Aires is a magnet for gay travellers. November’s Gay Pride (Marcha del Orgullo Gay) gets bigger each year, as do other events like the Queer Tango Festival. There’s no one gay neighbourhood but you’ll find many gay-friendly venues in San Telmo, Palermo Viejo, Retiro and Barrio Norte. Lima the capital of Peru, sits on the country’s Pacific Coast. Its historic centre is a stunning UNESCO-listed World Heritage Site, known as the ‘City of the Kings’, packed with beautiful palaces, colossal churches and fascinating colonial homes. Other top sites of Lima worth a visit include the Cathedral of Lima, the Plaza San Martin, the Larco Museum and the Plaza Mayor. Public transport in Lima consists of, buses, minibuses and local taxicabs. However, the main source of transport around the city is through the Metro de Lima, providing links between different suburbs around the city. If you prefer to grab a taxi, Uber is an excellent alternative. Peru has a spectacular and original gastronomic scene blending cuisine from across the world with local Peruvian techniques and flavours to give visitors a truly unique experience. Ceviche and ‘Loma Saltado’ are must-tries as two of the nation’s signature dishes. Despite an incredible reputation for quality meat, Lima caters for every diner and vegan and vegetarian restaurants are also plentiful. Lima also offers many Meet up groups, enabling visitors to meet with other tourists and locals to explore the city. While Peru is not as well developed as some nations when it comes to LGBT rights, progress is being made. Lima hosts an annual Gay Pride event and has many gay friendly bars and clubs including; Lola Bar, Casanova and La Cueva. The city hosts many annual events and festivals through the year that are worth attending, including; the Festival of Lima on 18 January, which celebrates the founding of the city, and the Lima Carnival. San José is one of Central America’s most relaxed, safe and pleasant capital cities. Surrounded by green hills, rainforests, national parks and dramatic volcanoes, it’s the ideal backpackers’ stop off. Before setting off for the wilds, don’t miss the ornate and historic Barrio Amon and the impressive Metropolitan Cathedral overlooking the old central park. As for museums, there’s the Costa Rican Art Museum amid the magnificent Parque La Sabana, the Jade Museum, the Children’s Museum, the Pre-Columbian Gold Museum, the National Museum, and the Peace Museum. In fact, you may well need to set aside more than a day to make the most of this intriguing city. For women travelling alone, Costa Rica and its capital are not exempt from petty crime, so take usual care when wandering about alone in the big city, particularly at night. Eating out in San Jose is cheap and a pleasure. You will find plenty of international restaurants across the city and for local flavours, you can enjoy typical tasty cuisine such as Gallo pinto (rice with black beans), usually eaten for breakfast, and casado (rice, beans and meat, with salad, fried plantain and tortillas) are served at small cafes all over San Jose. Vegetarians also eat well in the various vegan and vegetarian eateries dotted around the city. The gay scene in San Jose is alive and kicking and it is here that you will find most of Costa Rica’s gay and lesbian bars, ideal if you want to go out partying. Every summer, wrapped in rainbow flags and covered in face paint, thousands of Costa Ricans parade down Paseo Colón in Costa Rica’s annual pride parade, La Marcha de la Diversidad.